The clown loach is one of my favorite fish because of its antics and color. 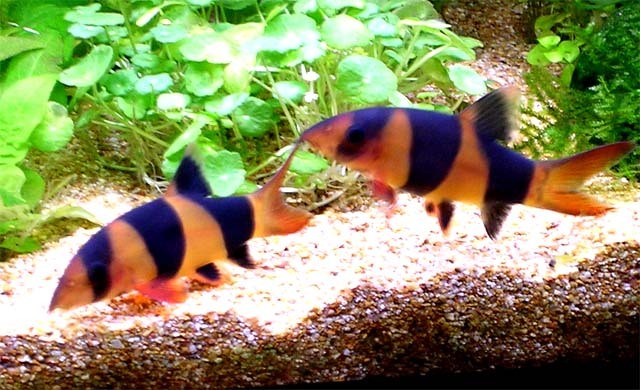 These loaches are diurnal (come out during the day) and go to sleep at night, literally. They find a nice nook to wedge themselves in (preferably in multiples of 3) and sleep all night, often on their sides or even upside down! Don't worry, they're not dead. They are a schooling fish and should be kept in groups of 3 or more so they have company. They are peaceful and are a great community fish, as well as having the added bonus of being a great snail eater. Although they won't likely eliminate all snails, they will keep the population in check. They need a larger tank, at least 30-55 gallons. They grow slowly, but will grow out of most tanks below this range. Bigger is better. Clown loaches are very prone to disease since they have no scales. Ich is the most common ailment, and often they are seen in the pet store covered in ich spots (makes my blood boil). It is almost guaranteed that after you get them home they will come down with it. These poor things are sensitive to ich medication as well, so only use a half a dose to treat it if you need to. Otherwise, they are easy to take care of. The best place to buy them is a local pet store, as shipping them may stress them out, causing them to lose their color and fade. This is often irreversible. Breeding these fish is next to impossible. Some say they don't even reach sexual maturity till they reach 30cm. Either way, very few accounts of them breeding in captivity have ever been heard of, so don't count on little baby loaches (although that would be just about the most adorable thing ever). Overall, these fish are full of personality and add a splash of color and entertainment to any aquarium large enough to hold them. 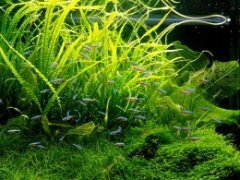 A aquarist in the UK claims to have bred them in the 90s. Apparently he put his loaches through conditions that are found in the wild. You said that color fade is irreversible? I have seen my loaches (clown and yoyo) fade their colors many times. This is a sign of stress. My loaches are always kept in groups of at least four and they will naturally establish a pecking order. During this time I notice the smaller or weaker loaches fade in color which always returns. A colorful loach is a happy loach. I also recommend keeping clowns in a large tank of at least 55-75 gallon as they can grow to be rather large and love to swim fast from end to end.